An ultrasound scan, sometimes called a sonogram, is a non irradiating procedure using high-frequency sound waves to create images. An ultrasound probe is used, which gives off high-frequency sound waves. You can’t hear these sound waves, but when they bounce off different parts of the body, they create “echoes” that are picked up by the probe and turned into a moving image. 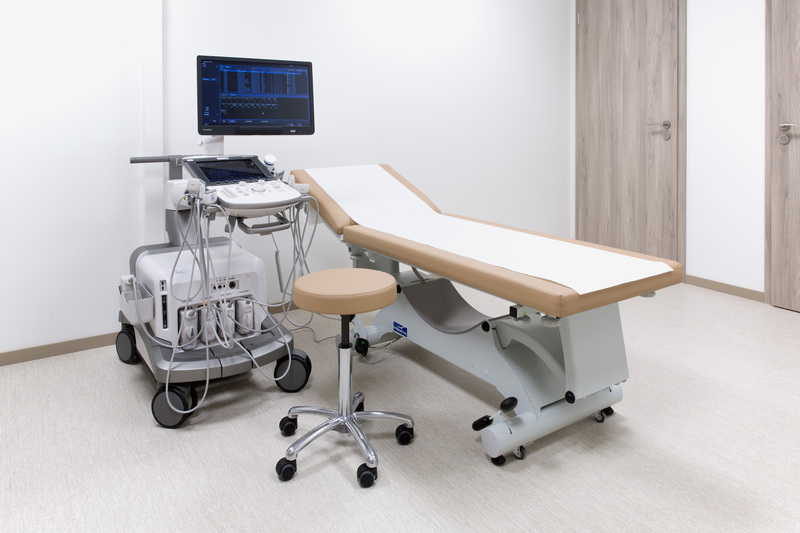 An ultrasound scan can be used to examine the liver, kidneys and other abdominal organs, as well as other organs or tissues such as muscles and joints. A handheld probe is placed onto your skin, and moved over the part of the body being examined. The use of a gel ensures there is continuous contact between the probe and the skin. Most ultrasound scans last between 15 and 30 minutes. They are performed by a radiologist. Injections, infiltrations or biopsies may be performed under ultrasound guidance, allowing a precise positionning of the needle for better therapeutical effect or diagnosis. Abdominal ultrasound : avoid eating for 4 hours before the scan. Lower abdominal ultrasound (especially for examination of the pelvic area) : drink water and do not empty your bladder until after the examination. Ultrasound of the thyroid and breast, muskulo-skeletal scans : no preparation required.